REVIEW THE SKY POLARIS TRACK AROUND THE WORLD! What are IGC Files? IGC means “International Gliding Commission”. Through a recording device that is on-board the Sky Polaris RV-8 the entire flight is recorded onto an IGC computer file that can be interpreted by software on your computer, or on-line at some websites. The benefit is that you can easily review the exact track over ground that the Sky Polaris project has flown. It is fun, educational, and is an easy way to see where the Sky Polaris flight has been. Here is an example of an IGC file that uses Google Earth to display the output. The image below is a static map, but by using software that you can download you can watch the flight re-created in animation. Each time the Sky Polaris RV-8 lands, Captain Michel Gordillo sends us an IGC file and we will post it here. To view an IGC file, you can download the file to your computer, then upload it to a web site that allows you to view the file. One easy to use site is www.gpsvisualizer.com. This website will allow you to create a link to Google Earth with the route loaded. 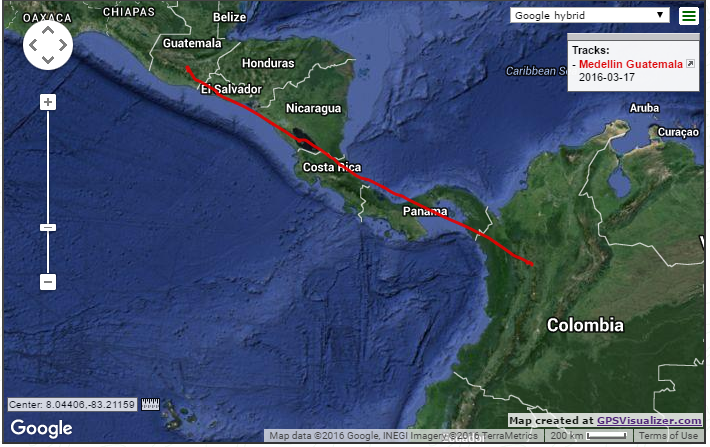 Here is an example of this: Medellin to Guatemala. There are many downloadable and web-based IGC viewers available. Just do a web search and preview the one that you like.